It has been raining for 3 days solid in Florianopolis and most people look truly miserable. Florianopolis unfortunately lacks the museums and cultural centres of big cities, as we are so spoiled with fantastic nature (most people really come here for the 42 beaches) and good weather most of the year. BUT bad weather does happen and if you are here on holidays and don’t want to follow the crowds to the nearest cinema or shopping centre here goes a few suggestions. 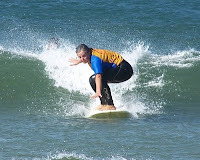 Some outdoor activities do not get spoiled by rain- you can still take some surf lessons, for example. Once in you are in a wetsuit and swimming you will not notice the rain at all. Rafting in the Cubatao River with class II-III rapids is ok for beginners most of the year, but when it rains a lot in a few days, it becomes an adrenaline-fuelled experience. 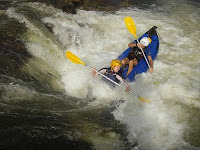 If you really enjoy rafting, rainy days are the best days to go.The rafting base is about 40 min from Florianopolis. If you want even more excitement try kayaking down the rapids. It is fantastic! If you just don’t like the idea of the outdoors on a rainy day, head for the Spa town of Santo Amaro. The thermal baths there are wonderful; the local mineral water is considered one of the best in the world. If you are on a budget you can get a bus from downtown Florianopolis to Caldas da Imperatriz that stops just outside the public baths. Next door you can have a café colonial in the old hotel that once welcomed the last Brazilian Empress (hence the name). Your day out should cost you less than R$ 30,00. If you like a bit more pampering, we can arrange for a day use of the facilities of the local 4 stars Spa resort. The Jacuzzis, sauna, mineral baths and Spa treatments followed by an excellent lunch will soon lift your spirits! Contact us for details. Santa Catarina is so well-known for its gorgeous coast that most people totally ignore the interior. Just a few hours away by road from the capital you can be in one of the most stunning mountain sceneries in Brazil: the Serra Geral Mountain Range. The journey to get there is already very scenic- to reach Serra Geral, you need to drive through one of the 3 mountain roads that cut Santa Catarina East to West. Originally open as mule tracks, they are still the few connecting points between the highlands and the coast. The BR-282 is the busiest and the least dramatic, while the Serra do Rio Rastro (SC- 438) and the Serra do Corvo Branco (SC- 439) are not for faint hearts, but they are both stunning. Once you get there, you are spoiled for choices of activities; you can go trekking, cycling, horse-riding, fly fishing or simply relax in a lodge or a resort. Some of my favourite programs in this area are the hiking trips near Urubici. Staying in a cosy mountain lodge, you can choose between easy day treks or the more demanding 3-days crossing of the São Joaquim National Park. We visited this area many times in the past and fell in love with its beauty. This weekend, however, we drove up the stunning Serra do Rio do Rastro mountain road, further south from Urubici to inspect another base to explore this region. The Rio do Rastro is a small resort in a 900-acres farm in Bom Jardim da Serra. Although this hotel is larger, lacking the intimacy of Rio Canoas mountain lodge, it has excellent facilities and a wide range of activities. We took a trip to the canyons, a horse riding trip and did a short trek through Araucaria and ancient ferns forests. For the cold or rainy days they have a heated pool, Jacuzzi, sauna and some romantic bungalows with lake views. The food was excellent as well. The highlight for us, however, was horse riding through highland fields to the edge of the mountains. The views were absolutely incredible, helped by a gorgeous sunset over the highlands. When visiting Santa Catarina next we really recommend you reserve a few days to explore this beautiful area. 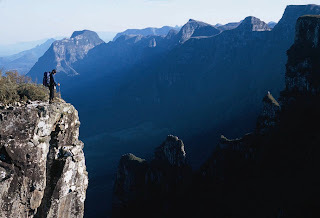 For more information about the Serra Geral mountains click here or contact us. After a month of huge variations in exchange rates throughout the world, we thought it was a good idea to give you some tips this week on which is the best way to bring holiday money to Brazil. For many countries a mix of traveller's cheques, US$ dollars bills and a credit card is a good idea, but in Brazil traveller's cheques are useless. Most places will not accept them and banks will charge you a high fee for every cheque cashed. We always recommend to bring one or two credit or debit cards and a little bit of cash (US dollar bills or Euros are readily exchangeable almost everywhere). Visa cards normally work better than Master cards for payments in shops and restaurants. By changing at ATM machines (available in almost every city in Brazil), you get the day's commercial exchange rate for the dollar, avoiding the low rates or extortionate commissions of Casa de Câmbios. Some cards have charges for foreign transactions, so check back home for debit cards or savings accounts that do not. In the United Kingdom, for example, Nationwide Building Society has a debit card that has absolutely no fees for cashing money abroad. Once in Brazil you might find out that some ATMs do not accept international cards. Look for HSBC branches or for Banco 24 horas machines, they will always accept VISA ( VISA PLUS in Brazil), Master, CIRRUS and MAESTRO cards . Use HSBC if you can find one, as Banco 24 Horas charges a small fee. In Florianopolis you will find a HSBC at the airport, in Lagoa da Conceição, near the Shopping Beira-Mar and downtown. But don't forget: if you are goint into remote areas for a few days, cash money at the airport or the nearest big city as in small places you will only find Banco do Brasil branches and their ATM machines do not always accept international cards.